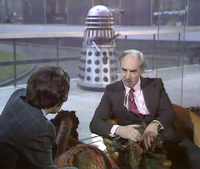 Doctor Who producer Barry Letts had generally been opposed the return of old foes during his tenure but the last two seasons had shown the Daleks were still popular. Deciding he needed a mid-season boost for 1974 he again elected to use the Doctor’s oldest enemies. As with Planet of the Daleks Terry Nation had been given first refusal on writing Dalek scripts and Terrance Dicks approached him with an idea for a serial concerning a search for an elixir needed to cure a plague threatening both humans and Daleks alike. Nation was commissioned to write a storyline on 23rd March 1973 but due to the birth of his son this was this was not delivered until 1st June. Dicks commissioned the scripts two weeks later on 13th June although in early July he met Nation to discuss a number of aspects he felt needed attention. Nation had included a jungle setting in which the Daleks would attempt to hunt down a group of humans. This was deemed too similar to Planet of the Daleks and so Nation adjusted these elements. The first script arrived on 27th July now with the title of Death to the Daleks. It has been suggested that this was an idea of incoming script editor Robert Holmes who was known to have little time for these particular monsters. The rest of the scripts followed the next day and Michael Briant was chosen to direct the serial. One of Briant’s first jobs was to assess the Dalek prop requirements from the scripts. Unusually for most Dalek stories he had a wealth of props to work with, finding the three hero props and the seven Goons leftover from Planet of the Daleks. He decided that six of the ten available props would be sufficient to cover the serials needs. As with the Shawcraft props, the Goons had been transported around the country to appear at public events. This led to two of the props being in a less than suitable condition even to use as scene fillers and so Briant decided that these would be used as FX props whilst a third would bolster the hero props. The complete Goon i was chosen for this task, whilst Goon iii and Goon vii would become the FX props. 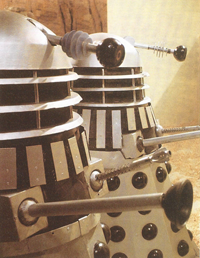 Briant preferred the silver livery of the sixties Daleks, citing them as having more impact than the recent dark colours, and so on 2nd November 1973 Jack Kine contacted Westbury Design with a view to having the six props painted into silver and black. The task began the very next day. The domes and neck were painted silver with the main bulk of the shoulders becoming black, with silver slats. The skirts were turned silver with black hemispheres. Other than the repaint the main three hero props received no refurbishment. Dalek Seven-2 retained the refurbished dome with orange lights that it had received for its appearance on Vision On.The Daleks by this point generally looked quite poor and the colour scheme actually highlighted the problems more. 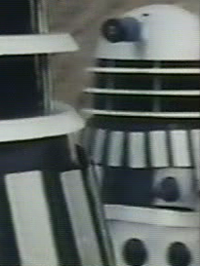 Collars and slats were now sagging and obvious damage was now apparent on the gun and arm boxes of Dalek Six-5. The neck cages, although relatively new, were also looking very shoddy and whilst attempts had been made to tidy up the splits by sanding back the affected areas, not much regard was given to placement. Minor issues, like the use of different types of suckers on the arms, were also starting to creep in more and more in this stage of the props lives. Very soon after the six Daleks were taken away for painting, the productions team moved to the ARC Sand Pits at Gallows Hill near West Lulworth in Dorset. 11th November 1973 saw the team begin to set up the filming and on the 12th, in a departure from the usual system, tracks were laid around the location for the Daleks to move along. In the past when the going was difficult, the Daleks had travelled on boards which was often time consuming to set up. Now however, the tracks were laid ahead of time and with the camera shots pre-planned, it meant work with the Daleks was much quicker. ‘Elemack’ wheels were temporarily fitted and a large plastic cover was wrapped around the fender to cover the mechanics. The tracks were kept out of shot at all times. Although the new method was generally easier to work with the operators would often dine out on stories of them careering out of control down gentle inclines. 13th November saw filming start and with neither of the series main stars available due to final shooting on Invasion of the Dinosaurs, work began with scenes involving the Earthlings, the Exxilons and, of course, the Daleks. One of the first scenes to be recorded involved Goon iii, now relegated to an FX prop and showing a clear split in the skirt. 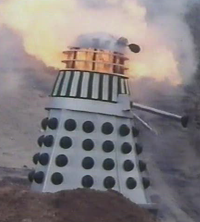 The prop was fitted with explosive charges and a specially made FX dome that would crumple easily after the explosion. With the prop sat high up on a cliff edge a probe from the Exxilon city was raised from a pool on a wire and aimed at the Dalek. The Dalek exploded and plunged off the cliff edge into the pool below, breaking off appendages as it does so. 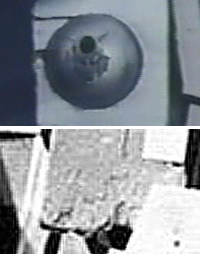 The damage to the prop is severe and was the last time it was seen on screen. Two days later would see the destruction of the other Goon prop. Now a hybrid of original and ersatz parts, Goon vii was also showing signs of damage. A severe split ran down the skirt and the prop was already fitted with a temporary sucker having already lost its original. Several hemispheres had also been lost since painting took place. Like Goon iii, Goon vii was also fitted with an FX dome that would easily collapse. 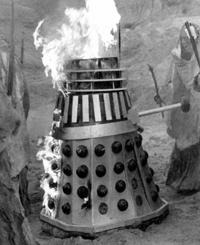 The scene began with the hero prop Dalek Seven-2 menacing a group of Exxilons but due to the Daleks’ lack of firepower it loses all composure under some gentle tapping by the Exxilons bows. The hero prop is substituted by the Goon prop and an explosion catches the neck on fire and removes several hemispheres. 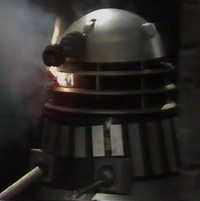 The Dalek is left to burn for some time whist several shots are taken, again ending the life of the prop and the Goon is never used again. The weaponry malfunction plot meant that the Daleks had to invent a new type of gun. They came up with a conventional bullet-firing type. This was realised on screen with a gun of vastly different style to that which had been used up till now. It resembled a machine gun with holes drilled along the barrel and fins positioned around the end. This was an actual cap firing gun that cause a great deal of noise within the prop itself. This gun was fitted as the scenes required but there are scenes when the original type is incorrectly still seen fitted. The usual trio of hero props, Dalek Six-5 (again missing some eye discs), Dalek Seven-2 and Dalek One-7 carried the bulk of the scenes on location but there is one small glimpse of Goon i in the background of one scene. Location work wrapped on 19th November and the props were returned to Pinewood where some minor refurbishments were carried out. Studio work was planned for early December and Briant decided to experiment with the usual way of recording Doctor Who. Instead of recording the episodes generally in order he decided to record things on a set-by-set basis to reduce the wear and tear and preparation times. However this immediately hit problems when a large part of the TARDIS set was missing and several props were delivered to the wrong studio. The four required Dalek props were also late in coming from storage. Recording commenced on 3rd December with the three hero props and the single Goon all present. The afternoon of 4th December saw the scenes recorded in which the four props emerged from their ship. 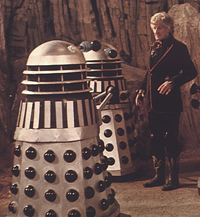 Dalek Six-5, Dalek Seven-2 and Dalek One-7 emerge first leaving Goon i to be pushed into the doorway by a stagehand. For the scenes outside the ship the Daleks were operated in a much more agitated manor than recent tales, making it unfortunately obvious that the static Goon i has no operator. 18th December saw the recording of the climax of part two. This involved Goon i temporarily becoming an FX stand-in in for Dalek Seven-2 which was being attacked by a city probe. Several flash charges were attached to the neck section and set off when the probe hit the prop. Maybe this was further evidence of the attitude the crew had towards the expensive props at the time. Due to the scenery problems and new recording methods, tensions in studio ran high. Jon Pertwee was at this time known to be very tired of the series and disliked the Daleks – in particular feeling they upstaged him. Briant also felt the script was uninteresting and didn’t inspire him to produce his best work. Barry Letts had also let it be known he was to leave the show very soon. The lacklustre atmosphere seemed to creep into the treatment of the Dalek props too, and it seems as if they were a casualty of disrespect from the production team. 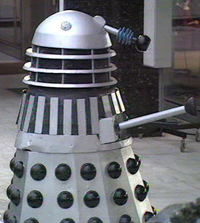 Although Dalek Six-5 was returned from Pinewood with its eye discs repaired, the general condition of the props hadn’t been addressed, and it seemed very little care was taken with them during studio work. The necks of all three Daleks were at various times either lifted from their cylindrical interior, or were out of alignment completely. 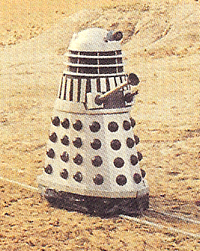 Poor handling also caused damage to the lower collar of Dalek One-7, when the shoulder section was placed incorrectly on the skirt, bending the collar underneath the shoulder section itself. In all, it was not the Daleks’ finest hour. With recording finished it was only a matter of days before the public would be treated to a viewing of the new look Daleks. 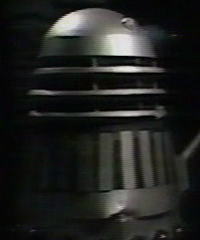 As had happened prior to Day of the Daleks a prop was to appear before transmission of the episodes. In this case the appearance in question was on the popular lunchtime magazine show Pebble Mill at One. The appearance of the new silver-black coloured prop was to celebrate the series’ tenth anniversary and SFX guru Bernard Wilkie was interviewed along with Patrick Troughton. A host of monsters appeared along with Dalek One-7 which was seen parading outside the studio. Rarely taped in natural daylight, the outing afforded good views of the prop and the condition which it was now in. In particular the lower collar damage was still in evidence and was even causing the shoulders to sit incorrectly on the skirt. It was a sad state for the important prop to be in, but perhaps reflected the BBC’s attitude at the time, if not the public’s, who were still drawn to the Daleks in large numbers whenever they appeared. The end of 1973 saw Terry Nation already being lead on developing ideas for the next Dalek story. Ideas that would eventually lead to one of the most popular Doctor Who stories of all time – but by the time the popular monsters returned to the screen, there would be a new face to battle them, and an entirely new angle on their villainous exploits.